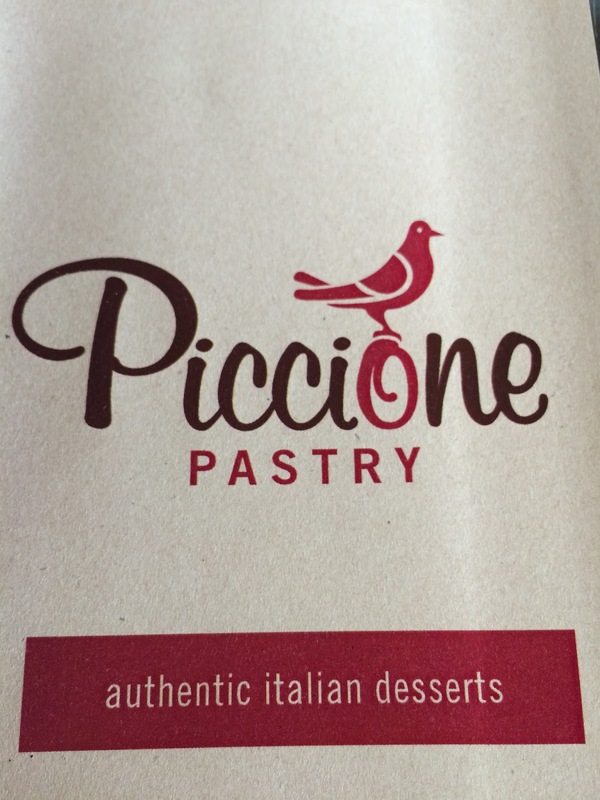 Piccione is a great concept, something somewhat similar to what I strive to achieve one day – I say “somewhat” because there was not much consistency or delicacy in their work. I know it’s just a bakery, but coming from fine dining experiences, (or even from a recent visit from a LA bakery, Republique) I believe that a great bakery can be consistent and beautiful. 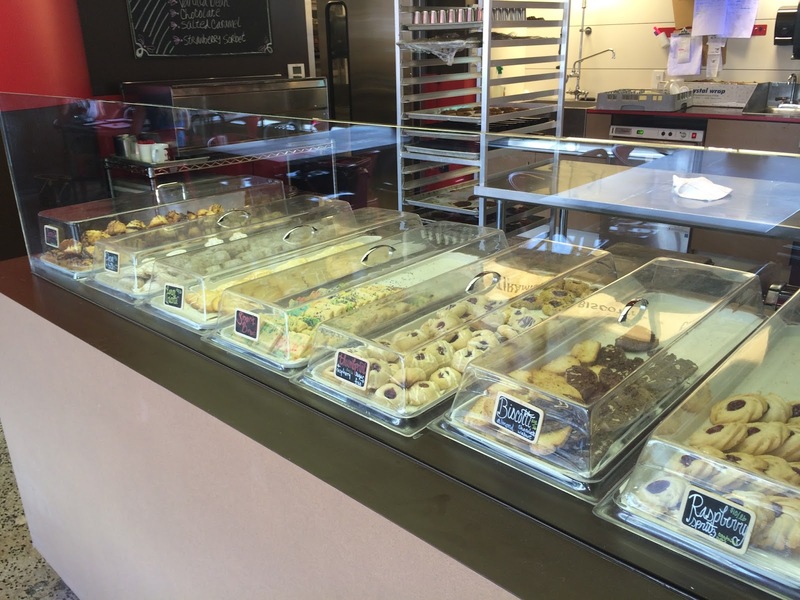 There are pictures throughout their website and shop that show beautiful baked goods, but their display cases did not showcase the same quality. However, if they are going for the “home goods” look then the display was sufficient, given the pastries tasted so darn good. 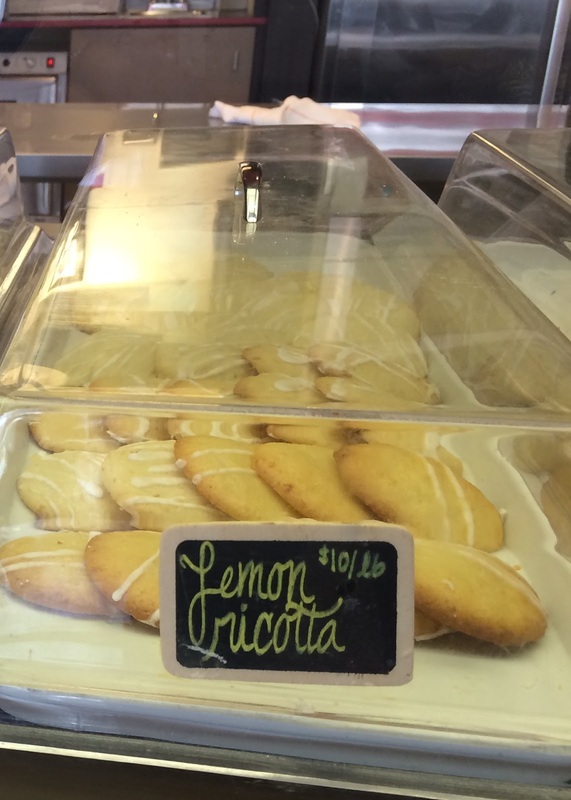 Piccione is a traditional Italian pastry shop with a little St. Louis charm that is known for their famous gooey butter cake that is classic with an Italian flare. 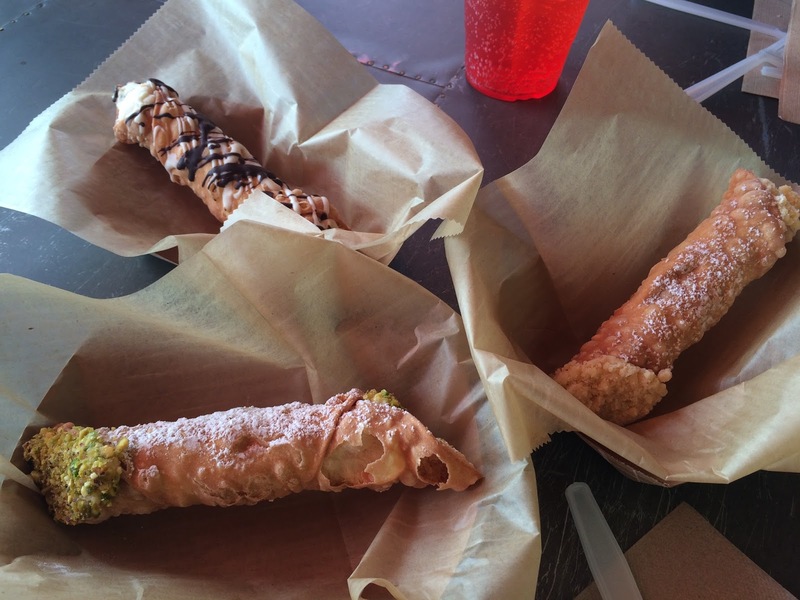 The bakery is also well known for their various types of cannolis. 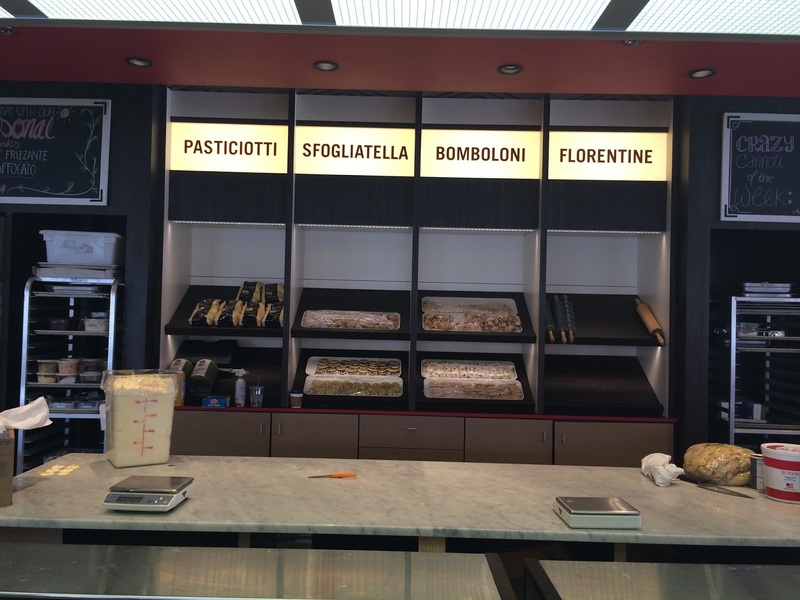 The display case of Italian pastries starts at the front of the shop with some fruit crostadas and frittatas, and then works its way down to cannolis, tiramisu, gooey butter cake, and a variety of Italian pastries and cookies. In the presence of such an intricate and profound display, my inner Italian took over and I was overwhelmed because I wanted to try everything! Although that was not possible, between the three of us we were able to sample a lot considering this was definitely the most I have ever consumed on my tour. Cannolis are cold and the cannoli shell itself was crispy and had a nice crunch. Every cannoli also had well made sweet ricotta cream fillings. The fillings ultimately made these cannolis fantastic! 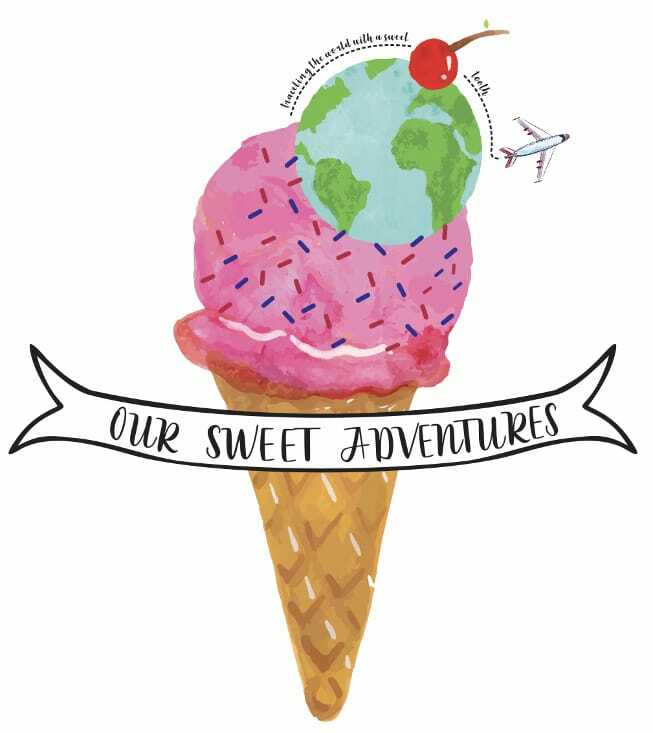 Very sweet and rich, but in a marvelous way! I could literally taste the sweet butter mixed with the luscious sweet ricotta. The ends of the cannoli had streusel that contributed an additional crunchy texture. 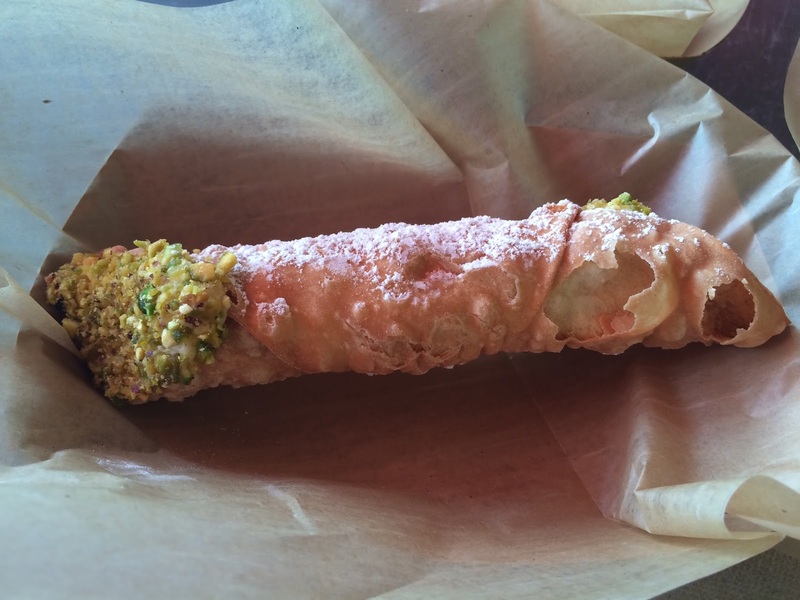 Pistachios did not overwhelm the cannoli and their nuttiness almost got lost in the sweet ricotta filling. 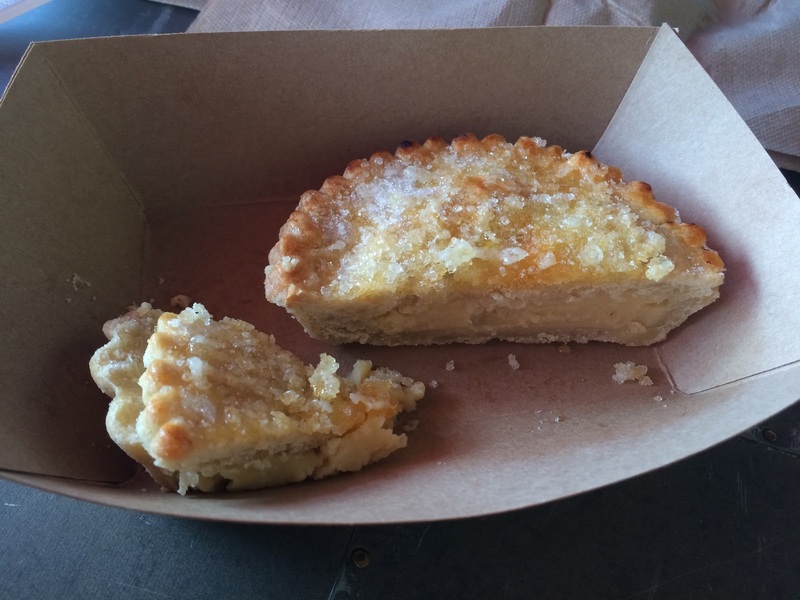 The pistachios were semi-ground within the filling; coarsely chopped pistachios would have been nice to give the pastry more crunch and distinct flavor. On a side note, my lovely future father in law and fiancé called the pistachios on the end…. fungus. Last time I bring them on a trip! 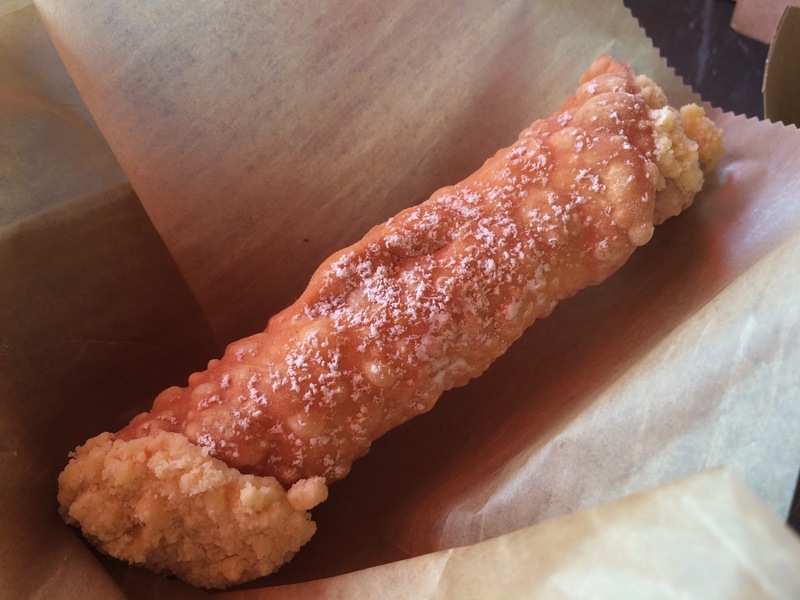 Of course this was Adams choice but as it turns out this was my favorite of the three cannolis. Boy did this definitely taste like cookie dough! 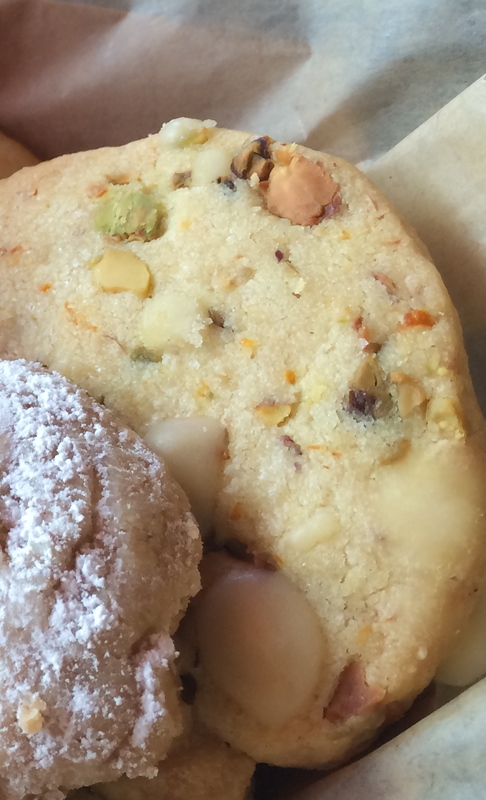 There were bits of cookie dough that really radiated inside of the ricotta filling. 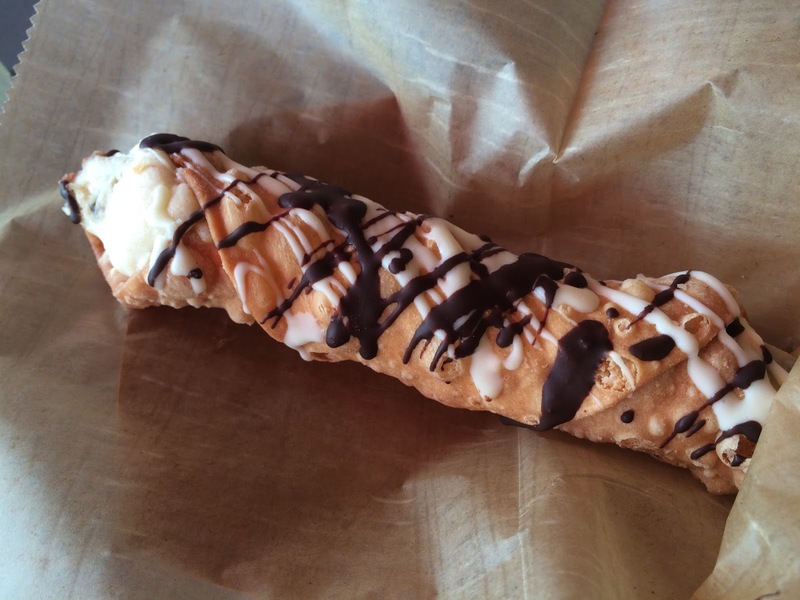 The dark and white chocolate drizzled on top of the cannoli made it a tad sweeter. 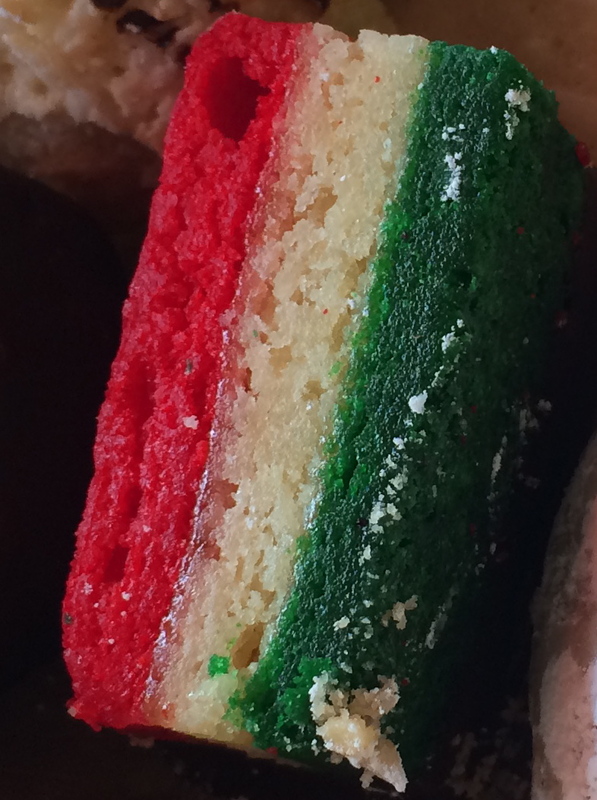 This is a popular Italian cookie that represents their national flag using color. 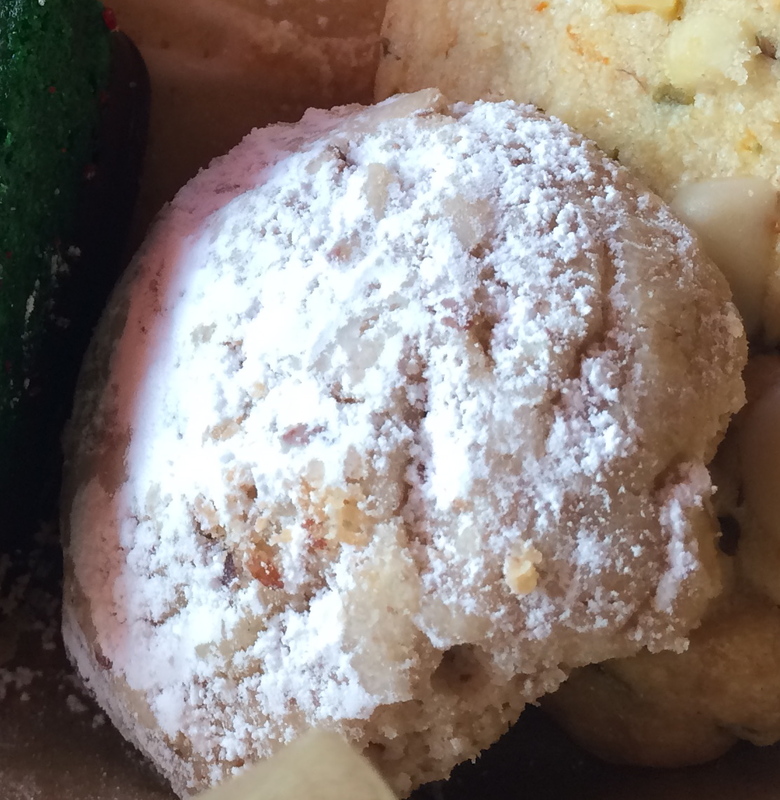 It is an almond based cake “cookie” that is colored with red and green food dye. The cake itself was good and the texture was light. In between the colored layers was a thin filling of sweet apricot preserves. The apricot is sweet and paired with the almond flavor well. I loved this impeccable combination because both flavors were able to stand out and balance one another. 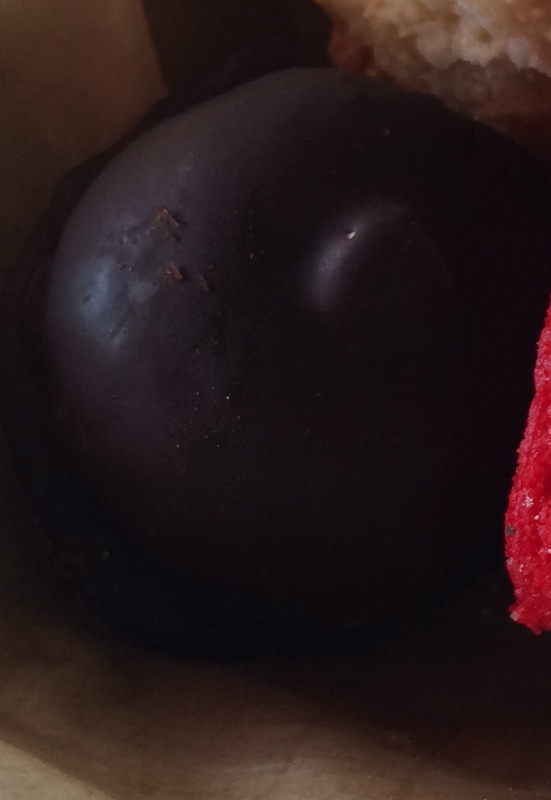 Lastly, there is a layer of chocolate on the end that balanced the almost-overwhelming-sweetness. The boys say they didn’t care for the chocolate, but I enjoyed it. 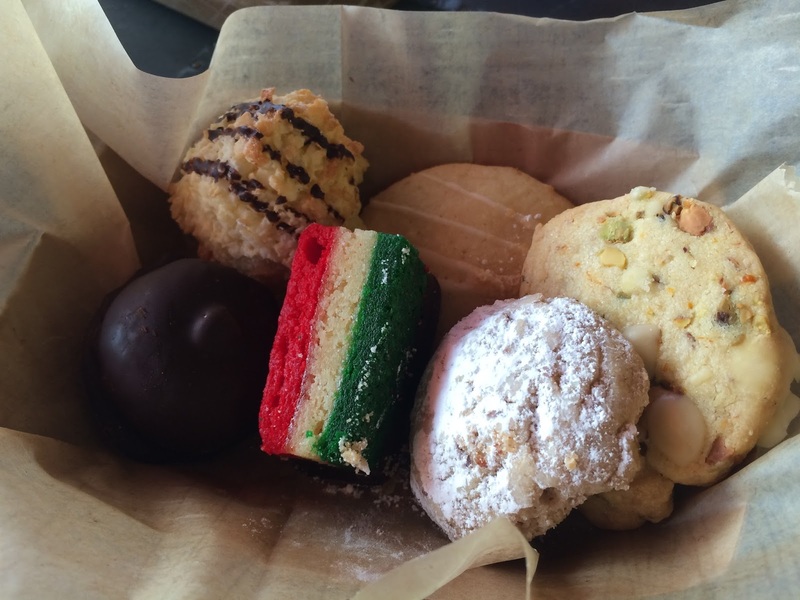 A great job on this classic Italian pastry. Italian for kisses! Traditionally a combination of hazelnuts and chocolate, this dessert should have been delicious however it failed to be something spectacular as a kiss. This was very similar to the famous candy, Ferrero Rocher – the chocolate hazelnut candy wrapped in that gorgeous golden wrapper (I always get them as gifts from my grandparents). I realize this is supposed to be a hazelnut pastry but it was very strong, overly nutty and hardly sweet, with a Nutella-chocolate filling, chopped hazelnuts, a whole hazelnut on top and chocolate coating. My least favorite thing about this dessert was that it unpleasantly dried my mouth out. LOVE LOVE LOVE this dessert because it reminds me of a cookie my mom makes for Christmas every year. Its almost like a russian tea cookie – light, sweet and nutty. Even with the ground pecans the cookie almost melted away in my mouth from the butter in the dough. The cookie was covered in powdered sugar, so even though I wanted to devour it all up I had to show some restraint so that I didn’t choke. 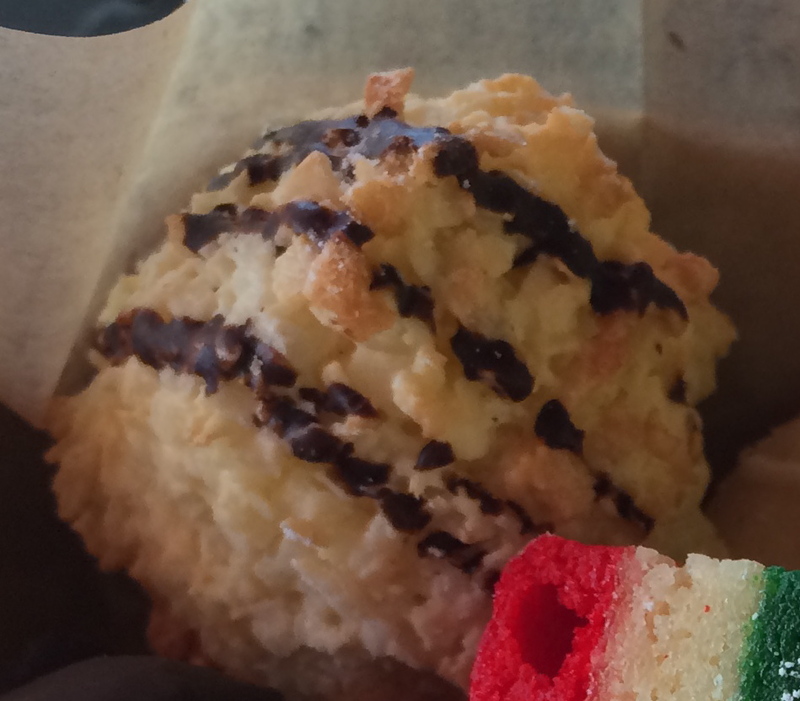 This sweet, crumbly cookie was fantastic! The combination of orange citrus and nutty pistachio was wonderful. There was also a lovely light orange glaze drizzled on top of the cookie. The flavors were well balanced, but the pistachio lingered slightly more in my taste buds than the citrus did. This was my favorite of the day. So delicious! This was actually more of a cake than a cookie. The citrus flavor from the lemon was profoundly distinct but the cake texture balanced the citrus, which could have been overpowering but ended up being light and sweet. Drizzled over the cookie was a delicate and simple lemon glaze. 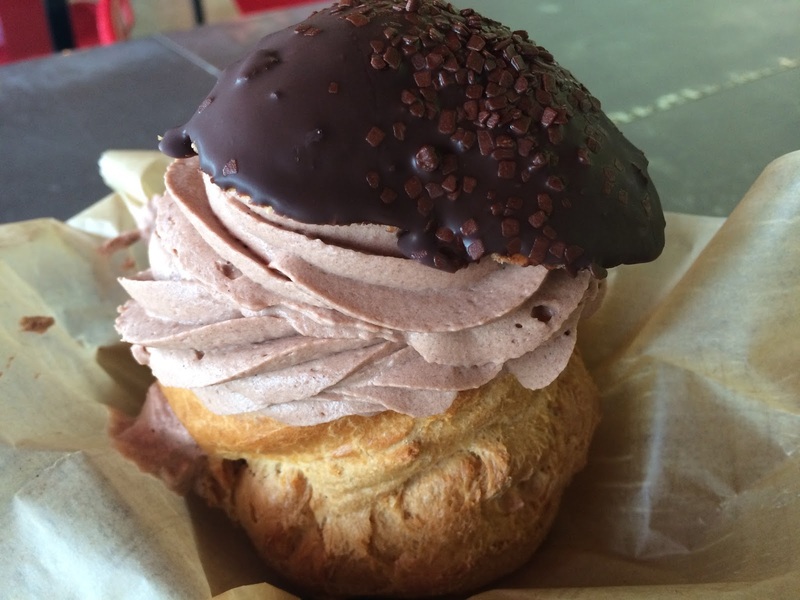 This is not a typical French macaroon. It was very very very sticky and sweet from the coconut. 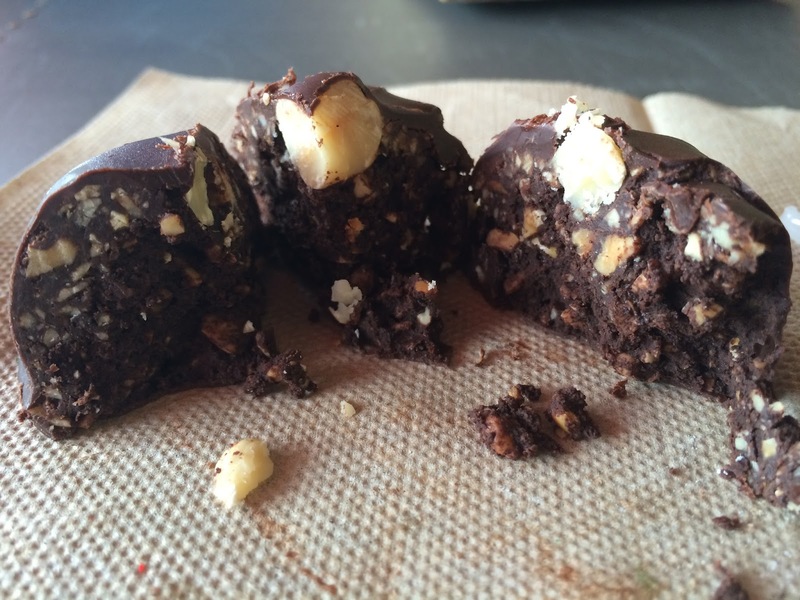 The best way I can describe it is just sweetened coconut flakes rolled into a ball, baked just enough to toast the flakes on the outside, and the finished with drizzled chocolate on top. Pasticiotti is a custard filled tart. Crystal sugar on top that is lightly caramelized, a custard encased in dough. The caramelized sugar on top gives a crunchy texture and sweetness to this pastry but besides that the dough of the tart itself is doughy and tastes like it is under baked. The custard filling is boring and flavorless. All in all a disappointing pastry for my taste buds. Cassata is a traditional Italian dessert that can be prepared in two different ways: (1) as a sponge cake layered with ricotta and candied fruit that is encased with a thin layer of sponge cake and finally frosted with icing; (2) with layers of sponge cake and gelato, or essentially as an ice cream cake – this latter is the type of cassata we had. Given this was an ice cream cake, it was almost completely frozen. My first bite was good and tasteful until I got to the too-sweet-pastry-cream which sadly overpowered the entire dessert. The strawberry gelato was sweet and tart with small chunks of strawberry. As stated before the pastry cream was overly sweet and I was not a big fan. 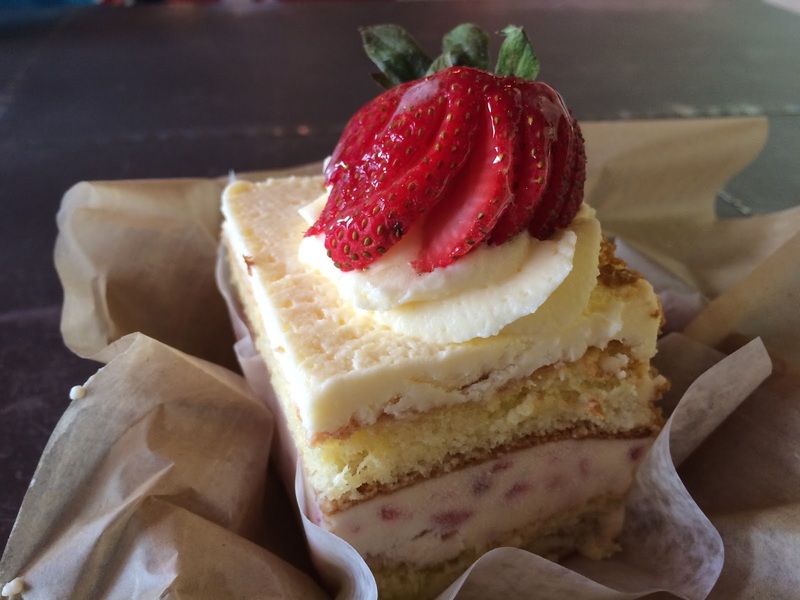 The sponge cake layers were the best part as they were light and nicely executed. I have a biased opinion when grading this dessert because the frozen texture did not appeal to me, but overall it was a good dessert that we all enjoyed.